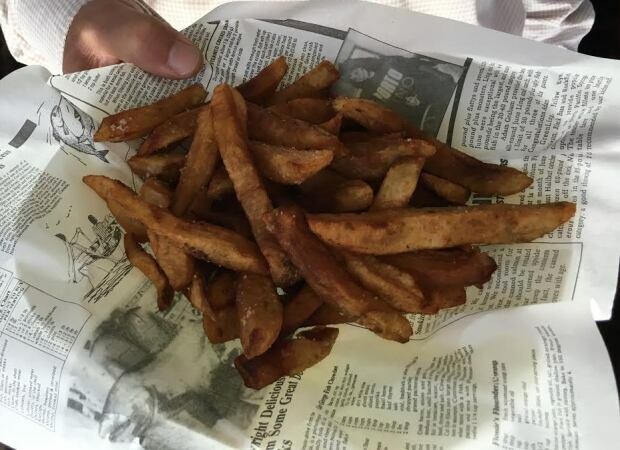 Charlottetown, he was surprised some restaurants on an island famed for growing some of the world’s best potatoes use frozen french fries instead of fresh, hand-cut ones. صنایعی دو سال است که در نمایشگاه امریکا شرکت می کند و می گوید رستوران دارها از اینگه چنین دستگاهی وجوددارد ابراز رضایت می کنند . صنایعی 180 هزار دلار خودش و مبلعی از هم دولت استانی و یک نهاد سرمایه برای تولید انبوه این دستگاه ها سرمایه گذاری کرده است . وی تا کنون 6 دستگاه در کارگاه خودش تولید کرده است . صنایعی می گوید در ظرف 4 ماه این دستگاه پول خودش را در می اورد . 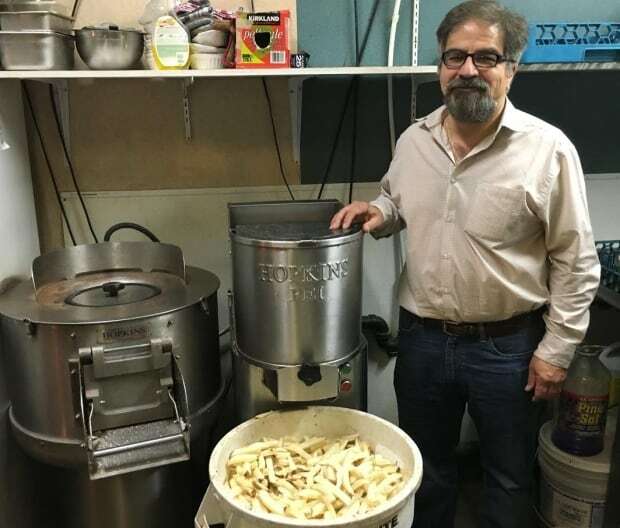 Sanayie — who is originally from Iran — hopes to change that with fry-cutting machines that can cut 23 kilograms or 50 pounds or potatoes in less than a minute. “I’ve got faith in this equipment, I know it’s going to work. 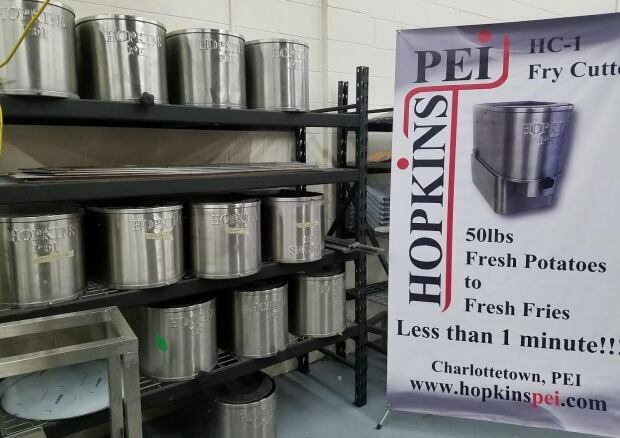 This is something we need in North America,” said the 56-year-old entrepreneur from Hopkins PEI, in an industrial park on Charlottetown’s outskirts. The company is affiliated with a company in the U.K. called Hopkins. Sanayie said the U.K. machines required some modifications to suit the North American market, and U.S. safety standards. “Back in U.K. for instance they don’t eat potatoes with the skin on, but we do over here. So we had to change the machine,” he said. The first of the P.E.I. machines have been operating for the past year at his own establishment as well as two other large-volume restaurants in Charlottetown: The Olde Dublin Pub and Gahan House. The machines retail for about $6,200 each. 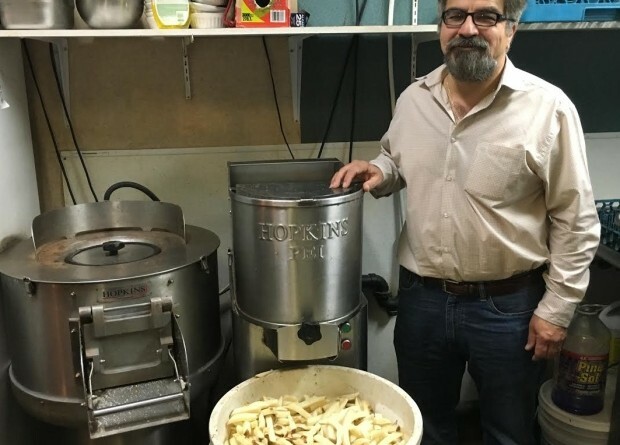 Although the Olde Dublin Pub stopped using it’s Hopkins fry-cutter, owner Liam Dolan said it wasn’t the machine’s fault — the pub just couldn’t manage the work involved and the space needed for storing and handling the high volume of raw potatoes. “It’s a great product,” said Dolan, noting it was just too hard for staff to daily lug 10 to 15 bags of potatoes weighing 23-kilograms each up three floors to the historic pub. A restaurant promoting hand-cut fries as a signature dish would be a perfect fit for the machines, Dolan added. Sanayie said he has found a market. He’s already sold 20 of the machines, he said, and has just received orders for 20 more, which he hopes to have ready by around Christmas. He’s also hoping to bring in business from the U.S.
Sanayie has received funding from the Atlantic Canada Opportunities Agency and from the P.E.I. government for wage subsidies, marketing and travel to trade shows. He’s also invested $180,000 of his own money, he said. 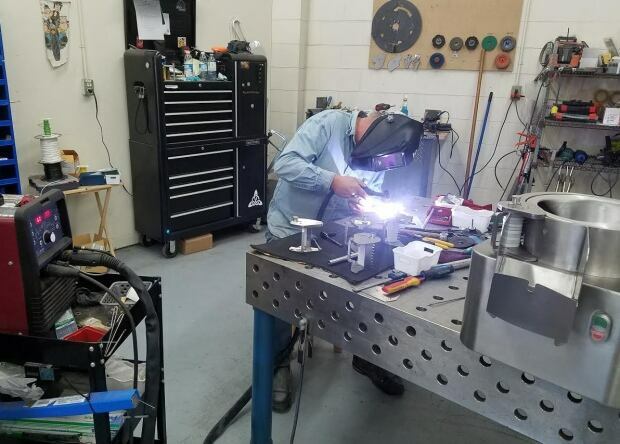 Hopkins employs five — soon to be six — other people at its manufacturing facility. “I like it. I’m a workaholic,” he laughs of the effort of getting the business off the ground. “I’m running three businesses right now!” He also runs a seasonal restaurant in Cavendish in summer. He hopes the fry-cutter business will turn a profit in 2017, he added.